The Health Insurance Portability and Accountability Act (HIPAA) define standards meant to improve the efficiency and effectiveness of the nation's health care system by encouraging the widespread use of electronic data interchange. Title II of HIPAA, known as the Administrative Simplification (AS) provisions, requires the establishment of national standards for electronic health care transactions and national identifiers for providers, health insurance plans, and employers. These provisions also address the security and privacy of health data. All medical providers are required to file their electronic claims using the HIPAA standards in order to be paid. The HIPAA Privacy Rule regulates the use and disclosure of certain information held by "covered entities" (generally, health care clearing houses, employer sponsored health plans, health insurers, and medical service providers that engage in certain transactions). 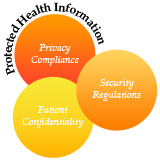 It establishes regulations for the use and disclosure of Protected Health Information (PHI). PHI is any information held by a covered entity which concerns health status, provision of health care, or payment for health care that can be linked to an individual. This is interpreted rather broadly and includes any part of an individual's medical record or payment history. This workshop focuses on the implications of HIPAA legislation and identifies critical compliance requirements for the business / client. Participants explore HIPAA’s Administrative Simplification Act as well as how to create a framework for initiating and working toward a blueprint for HIPAA Privacy Compliance while understanding HIPAA Security rules and regulations. The HIPAA workshop is meant for individual specialization of IT employees with basic knowledge about Information Security. The program is spread over two full days and goes into greater depth with case studies and exercises. The objective of this workshop is to help participants understand the role of Privacy Compliance Officer and Security Compliance Officer as per the requirements of HIPAA Compliance Audit. This workshop provides participants with advanced competency in designing, implementing and administering comprehensive privacy protection programs in all types of health care organizations. This workshop is meant for professionals responsible for HIPAA implementation / compliance in any organization. In general, all employees of healthcare provider organizations, health care insurers, and health care clearing houses who come in contact with Protected Health Information (PHI) are required to comply with HIPAA.